Find a reason to invite a guest by placing this luxurious hand-knotted carpet in your room. It is made in pure New Zealand wool and cotton material in India. It has taken about 8-9 months to weave. This is a highly durable and 100% hand washable rug. Bring charm to your home by putting this"One of a king" area rug. It is woven using handknotted technique which is the oldest technique to make carpets and rugs. 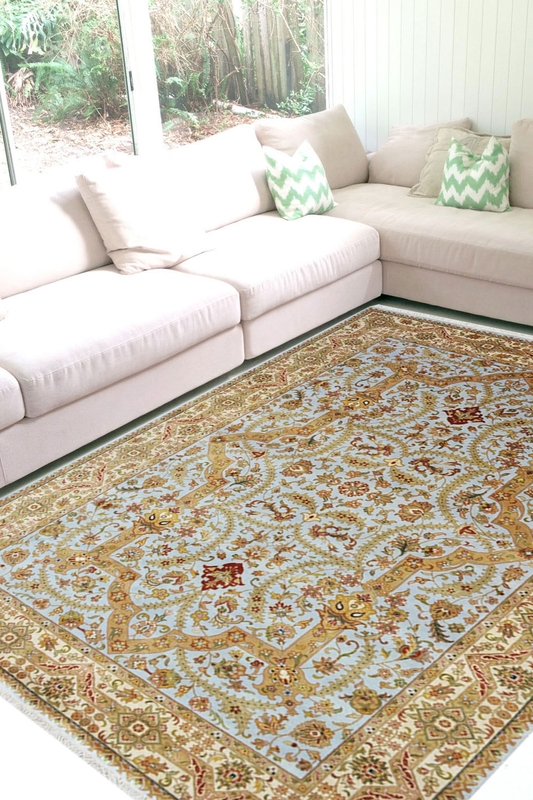 The ground of this carpet is in powder blue with gold motifs and it is a perfect combination of a unique carpet. It contains Tabriz design pattern. The warp is in superior quality cotton and weft is in pure New Zealand wool.